Maximum size: 4.7 mm (extrapolated from shell length). Distribution: Big Island, Maui, Oahu, Kauai, French Frigate Shoals and Midway: widely distributed in the Indo-Pacific and possibly the eastern Pacific. 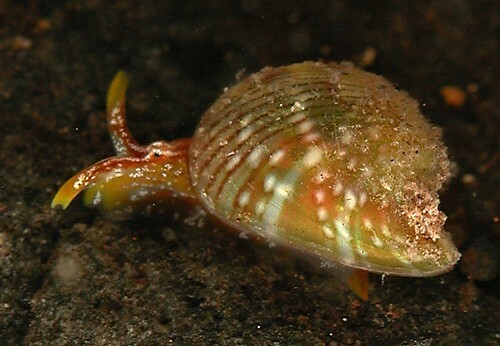 Photo: CP: 3.6 mm: Hekili Point, Maui; March 22, 2006. Note 1: Shells of this species show moderately strong red fluorescence under ultraviolet light (395 nM), most prominently when worn.